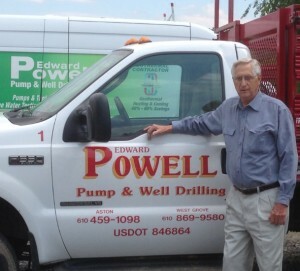 Edward Powell Pump and Well Drilling, Inc. is backed by nearly 50 years experience in the water well and water treatment industry. After 22 years of experience in the industry, Edward Powell decided to begin his own business. Starting with a little pickup truck, a couple of pumps and tanks, and an honest hard work ethic, his phone began ringing the very first day in business. It has never stopped! Since then, his company has served thousands of customers drilling wells, making repairs on wells, pumps, tanks, and conditioners. His sons, David, Chris, and son-in-law Brett, took over the reigns in the summer of 1997. Since then, the business has tripled in size and capabilities due to the same determination and ethical practices as their father. David Powell, president of Edward Powell Pump and Well Drilling is also the co-founder and president of Wells For Relief International, a nonprofit supplying water to impoverished communities in Ghana, West Africa. To learn more about how we are helping to make a difference around the world in reference to clean water and those in true need, please visit Lifetime Wells International.